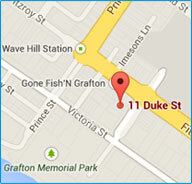 Delivering professional, affordable and friendly dental care is our aim at Grafton Dental Centre. We offer a comprehensive range of tailored general and cosmetic dentistry treatments using the latest technology and procedures. As such, our qualified team can restore and maintain optimal oral hygiene in every patient and meet your long term dental needs. Click on the links below for more information about the dental services we offer. A number of pain-free and sedation dentistry options are also available for anxious patients and those who may require lengthier, more complex dental care. Contact our team today to discuss any dental concerns or to schedule a consultation.